The Andrews Hotel is centrally located near Union Square and the theater district, making your stay here truly unforgettable. There are six theaters within an easy two-block walk, as well as stores and restaurants abound. Everyone can find something suited to their tastes in this lovely neighborhood. 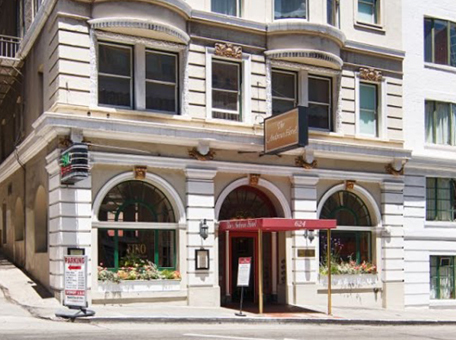 When you choose us as your lodging option, you'll meet our receptionists who know the city well and strive to make your visit to San Francisco memorable. Personal assistance in planning any detail of your stay is always available. Whether you need restaurant reservations, theater tickets, or help with booking sightseeing tours, we are here for you. Car rentals and airport shuttle services are available as well. Whether you're a food enthusiast, love sightseeing, or just need some solid relaxation, we have something in store for you. 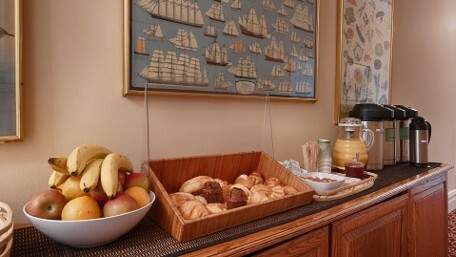 Enjoy a complimentary continental breakfast buffet each morning or treat yourself to a free cup of locally roasted Weaver's coffee or tea. If you need to catch up on some reading or check your emails, we also offer free Wi-Fi throughout the entire hotel. Relax and peruse one of the many information guides about the city and Bay Area, or simply take a break from the day's activities in our comfortable lobby. You won't be disappointed while spending time in this lively yet quiet space. After a long day of sightseeing, nothing is better than a complimentary glass of wine at Fino, connected right to our lobby. As a popular gathering place among locals and visitors alike, Fino's highly praised menu is one of a kind. It features many finely prepared Italian classics, along with an assortment of innovative daily specials including fresh fish. The building at 624 Post Street in San Francisco was completed in 1905 just before the great earthquake on April 18, 1906. Because it was built as a Class-A structure and completely supported by a steel frame, it suffered little damage. However, the fire that engulfed the city after the quake did take a toll on the lobby and restaurant. After being repaired the following November for $38,000.00, the building assumed its planned role as the Sultan Turkish Baths, a gentlemen's bath and relaxation establishment. The large electric sign on the roof announced its arrival on Post Street. As a full-service business, the Sultan Baths featured a restaurant on the ground floor. The next level housed a saltwater plunge, tiled hot room, and rubbing chamber. On the third floor, one could find a barber, chiropodist, as well as a bar and lounge. The fourth and fifth floors featured small sleeping areas and a steam room. Finally, on floors six and seven, rental of one of the several small apartments was available, each containing a bedroom and a parlor. Rumor has it that the establishment had a rather unsavory reputation! In 1919, the fifth, sixth, and seventh floors were renovated and converted to hotel rooms. The restaurant became a soda fountain and lunch cafe, for which a new and separate entrance was built. In the process of this improvement, one of the two beautifully arched windows was removed, destroying the symmetry of the façade. This window was replaced during the 1991 renovation of the restaurant. In 1928 the Sultan Baths closed, and the entire building was remodeled into a hotel. Over the next several decades, 624 Post Street housed a wide variety of occupants. Guests ranged from office workers in the 1940s to foreign youths seeking inexpensive accommodations while visiting San Francisco during the 1970s. The building was also home to a number of restaurants, including The China Doll—which was noted for its aquarium that spanned almost an entire wall. In 1981, Harry Andrews purchased and refurbished the building. He named it The Andrews Hotel in honor of his grandfather who had built a hotel by the same name in Minneapolis around the turn of the century. 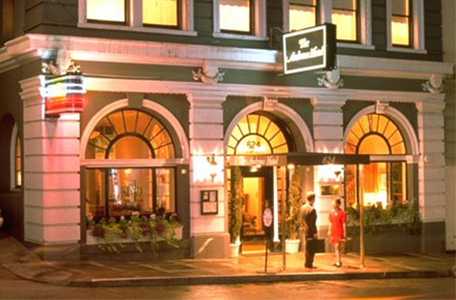 The restaurant was renovated in 1983 and opened as the Post Street Bar and Cafe, featuring innovatively prepared American regional cuisine. A rave review in Gourmet magazine helped to catapult the cafe into the stratosphere of the San Francisco food scene. As times and tastes changed, the space underwent yet another transformation in 1991. This included a full facelift, reopening as Fino Ristorante & Bar, serving outstanding Italian cuisine. 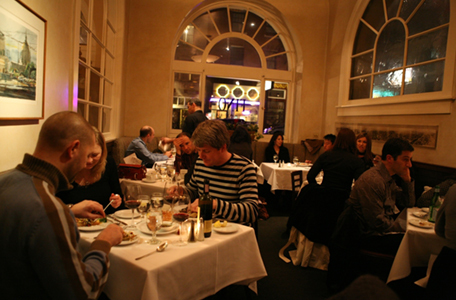 Fino was selected by the San Francisco Chronicle as one of the best values, as well as one of the ten most romantic restaurants in San Francisco. To read more about our hotel, check out our history or download our press release.